Another week and yet another “gay awards scheme” appears to be attracting some dubious nominations. Read our article “The Truth about where your wristband money really went” which explains how together they conspired to ripped off Manchester’s long suffering LGBT Community last year by making multiple funding bids for the same organisation under different names and therefore siphoning off the funding into one big fat pot. Whilst we have no objection to the claim that that the groups and businesses being promoted are just as worthy candidates to win an award as any other and no doubt provide excellent services to the community but the question must be asked- why is Manchester City Council participating in the unfair influence of a democratic process by sending this request to its entire LGBT mailing list? Other groups hoping to be nominated may also be reminding their supporters to vote for them but this is a council mailing list which includes people who are neither Pink Paper Readers and who most likely have never heard of or used the services of this cliquey list of “friends” the email is suggesting people nominate and vote for. This use of the mailing mailing list in this manner is clearly biased an inappropriate, its completely unfair to other worthy groups and businesses and it smacks of favoritism. Taurus, the Lesbian and Gay Foundation (who run Icebreakers, the 40+ Group and Northern Wave Swimming Group) and Manchester City Council are all heavily in bed with the controversial Manchester Pride – also nominated for an award. Terry Waller claims this request is purely “information we have been asked to distribute” however previous attempts by other organisations not connected to funded by Manchester City Council have failed to be distributed are frequently ignored. Although his mail shots are sometimes useful and informative they rarely contain anything other than more promotional extracts from the Lesbian and Gay Foundation or Manchester Pride – which have plenty of more direct and dedicated means of contacting the community. 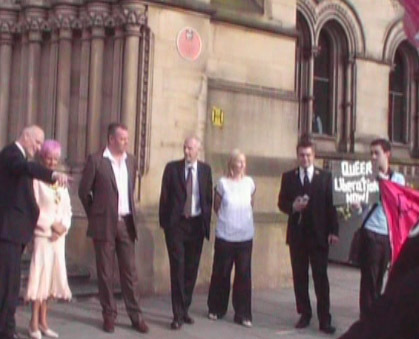 Manchester City Council and “friends” at the Launch of Manchester Pride 2008. Together they have sent requests to a public city council mailing list to canvass support in order to swing the vote in favour of their organisations in this year’s Pink Paper Awards. Despite causing so much anger and controversy within the community, GayMafiaWatch has heard Manchester Pride has been nominated for a Pink Paper Award too. because they read “Pride Not Profit”. promoting a probe by Trading Standards. try to cover up their actions. The protest group “Pride is a Protest” claims it has been shamefully airbrushed out of the official pride photos. If it’s not clear to you what Manchester Pride is all about, they have made it clear what its not about by doing this. As Manchester Pride came to a close at end of August 2008, Phil Burke (who was missing from the above photos) Chair of the Village Business Association (VBA) resigned from the board of Manchester Pride in frustration and declared “Manchester Pride is a marketing event run by ‘dictators’ “. It made the front page of the Manchester Evening News later that day where he continued to speak out and claimed “Manchester Pride is Purely a Commercial Operation“. Dozens of other small businesses, charities and community groups and local councilors of all parties have since spoken out in support of Mr Burke including Body Positive, Cruz 101, The Rembrandt, Eden, AXM Group, LGBT History Month. Queer Youth Network, OutRage! and the NUS LGBT Campaign. In October 2008, UNISON (the largest of all the trade unions) voted at it’s recent LGBT conference to condemn the actions of Manchester Pride and has agreed not to provide it with sponsorship to the event next year.